I open my eyes. All is still dark. Should I try to get back to sleep? No, it’s 7 AM and I’ve had a good night’s sleep. I begin the check-in. At age 78 my “preflight check list” is nearly as long as that of an airline pilot preparing for a take-off. Respiration—OK. Digestion—quiet. Elimination—the usual urgency. Try standing up. Yes, balance is OK. Walk to the bathroom. Do the usual. Brush teeth. Brush hair. Get dressed. Same old, same old. I’ve done it thousands of times. Now, the question of the day: Do I feel like walking the Camí de Sant Jaume? Maybe. Does Elyn feel like walking? Yes. How is the weather? Perfect (cool, still, sunny). OK, we will walk. We had left off at Amer and taken the bus back to Girona. Now we will take the bus to Amer and walk to Les Planes d’Hostoles. After breakfast and loading my day pack with water and snacks, we walk to the bus station. Everything is totally routine. We get on the bus. The driver is that nice Dutch lady we have had as a driver before. She has revealed that she speaks perfect English, so we greet her in our native tongue. 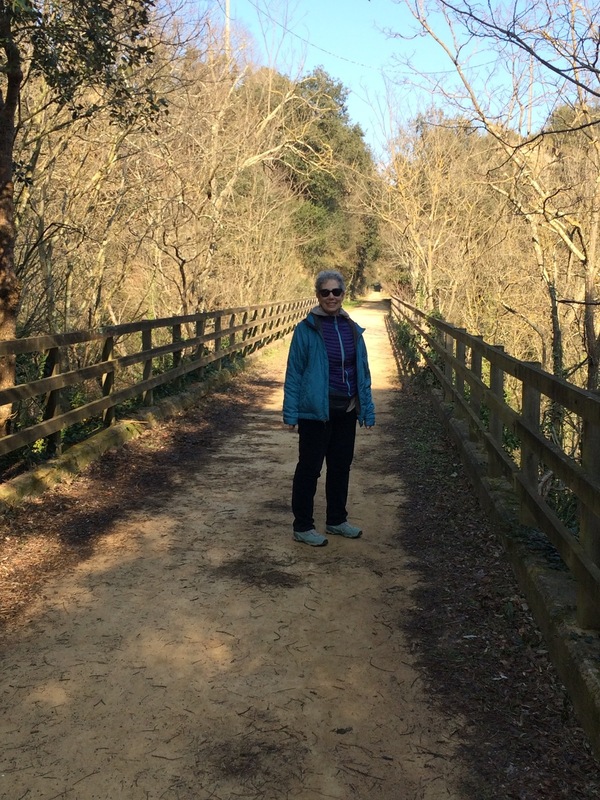 She has been thinking about our walking the Camí de Sant Jaume and has suggestions for us. It turns out that she has worked as a tour guide in the area and is a veritable font of information about interesting places that we haven’t heard of. Elyn takes out her notebook and begins to take notes. I relax, knowing that Elyn will get it all down and there will be some interesting times ahead for us, going to these new places. Our driver makes a left turn where she had always made a right turn before. That’s different. Not the “same old, same old!” My ears perk up a bit. After a block or so, one of the other passengers comes forward to remind the driver of her destination. Embarrassed, she quickly makes a U-turn at a round-about and resumes the proper course. She has let her enthusiasm for telling us about wonderful places distract her. Now I’m fully awake and aware that the day may not be quite as routine as I had thought. I start thinking about all the places I have half-heard about and a new sensation begins to dawn. How wonderful to have this new information! How wonderful to have a partner who has carefully taken it all down! Gratitude that I am so fortunate as to be here at age 78, walking through this lovely countryside with my beloved partner at my side. I think of others, my age and younger, who can’t do what we are doing—walking the Camí de Sant Jaume with relative ease. These musings occupy my thoughts for the rest of the trip to Amer. In Amer we stop for coffee at the Torrent Bar and Restaurant where we stopped at the end of yesterday's walk. They recognize us and tell us another way to get back to our trail. We find our way to the old narrow-gauge railroad right-of-way that has been converted into a green way for walking and biking. Our way stretches out before us, rising smoothly and continuously as we approach the mountains ahead. We wend our way up the gentle incline, and our path goes through narrow slots in the stone, alternating with ancient railroad bridges over ever-deepening valleys. My attention shifts to those 19th-century engineers who planned and executed this smooth path through the mountains. I express my gratitude to these people who paved the way for us to enjoy our walk. I point out some of the geology and explain how the railroad line was built. Elyn likes to talk to the stones along the way. She notes how some stones look like faces and enjoys how one pair appear to be kissing each other. She says that she and I notice different things and see things in unique ways. I am grateful for our different ways of seeing the world and being able to share our unique perspectives with each other. Our walk is somewhat strenuous, since every step we take is a climb to a higher elevation. We meet groups of bicyclists who have had their bikes ferried to the top of the Green Way (Via Verde) at Olot and are enjoying an easy down-hill ride. More power to them! But they are missing a lot of the details that we are enjoying. And we have the time to stop and look and take photographs. We meet a walker with a stick, coming our direction. He tells us that he remembers when the steam engine used to run on this right-of-way. “It was just like in the wild west!” he recalls. His eyes glow with the memory of those beautiful days of his youth. I can almost see that little steam engine puffing its way up the hill. Gratitude for that memory that he has shared with us. Finally, after several rest breaks on the park benches that have been conveniently provided, we reach our destination for the day—Les Planes. It is 1:30 PM. We are hungry and just in time for lunch. 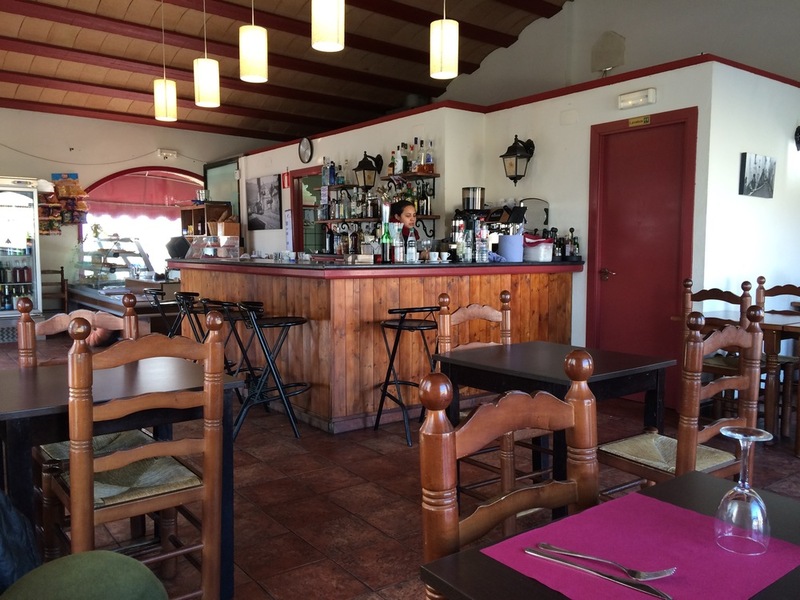 We notice El Rebost d’en Bacus, which is advertising a 10€ menú del día, and take our places at one of the tables. A lovely young woman brings us a copy of the daily menu sheet, and we are surprised that the menú del día has symbols designating which dishes have eggs, gluten, fish, or shellfish. We are thankful to have such a carefully crafted menu, given that we are both on a gluten-free diet. We order the grilled artichokes that cost an extra 1.50€, followed by lamb chops at a 2€ supplement, and a gluten-free brownie for dessert. Our three (yes, three!) grilled artichokes arrive with outer leaves practically charred and the delicious inner leaves cooked just right. The romesco sauce is gluten-free and we dive in for a succulent meal. With hardly room for more, we find the three lamb chops and grilled veggies equally wonderful, and we manage to down the whole lot. The gluten-free brownie is also amazing and Elyn asks the waitress if the chef will share the recipe with her. A man (who may be her husband) comes out of the kitchen with a hand-written recipe. It is indeed made without any flour. How have we managed to find such a wonderful restaurant in this village in the hills? All this bounty (including wine) for only 13.50€! I am noticing that I have been expressing gratitude at every step of this journey. It is as if I have made a new silent, internal friend who is seeing through my eyes and appreciating every detail. He is a welcome addition. May he stay with me forever. On our way out of the restaurant I see a photograph on the wall of the little steam train at the local station. The restaurant owner tells us that the photograph was taken on the final day train run in September 1969. I ask to take a picture of the photograph to share with you here on FandangoLife. Somehow, the poignancy of that moment is especially touching to me. I notice that someone had placed a large bouquet of flowers on the front of the engine to celebrate that special day. 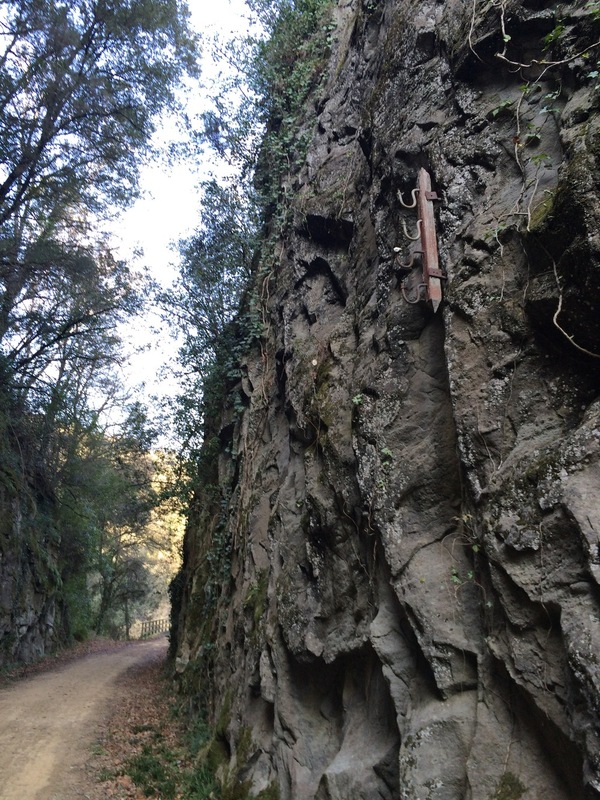 I am thinking of all those miles of right-of-way we have walked from Girona, and the fellow hiker who has shared his memories of the little train with us. Gratitude to him and to the train and to all the workers who constructed the railroad right-of-way. And gratitude that we have the energy to make this journey. September 1969. The train at Les Planes station—the final run from Girona to Olot. And finally, gratitude to my new silent friend, who shows me just how fortunate I am to be here sharing these special days with you, my faithful readers. You just never know, when you open your eyes in the morning, what adventures await.